Can anyone give any information or names on this. 2nd from right on front row Emily Carr. Photo courtesy of Glyn Beedham. 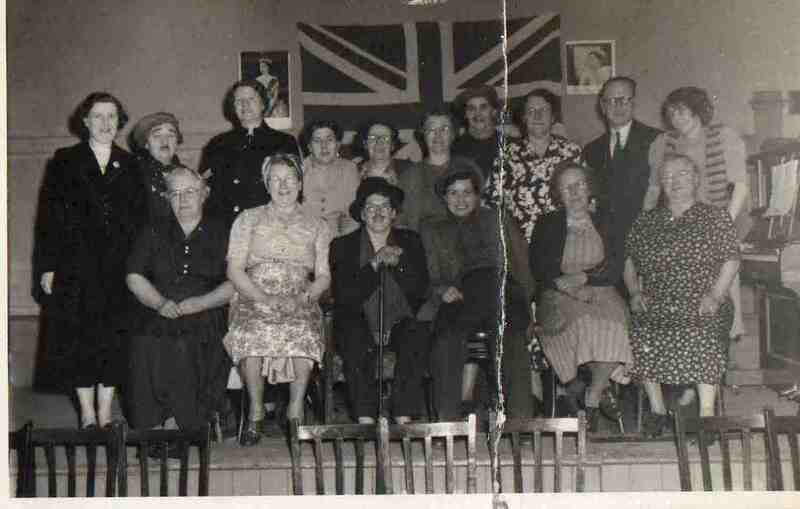 4th from right on back row (with moustache & cap) is my mum Betty Marshall. This was a play by the British Legion. I remember going to watch. Back Row: Third from right is my grandmother Alice Chawner. Front Row: Third from right is Ethel Robinson (nee Barker). I believe it is to do with the womens work of the British Legion . My mother Ethel Robinson (nee Barker is) on the front row third from right. This was one of several plays put on by the ladies of the British legion for fundraising. I remember helping her with remembering her lines. For quite a few years my mother acted as standard bearer for the Royal British Legion, what a superb organisation for all the good work that they have done and will continue to do so.